*Two layers of fluffy, chewy meringue filled with Lindt White Chocolate Cream and sprinkled with fresh raspberries, pomegranate arils, and orange slices. When it comes to dessert, I think “what can I make that is extravagantly delicious” first and “what am I going to with/who is going to help eat this extravagantly delicious dessert” second. Such a way of going about things often leaves me with a lot dessert on my hands with no one to eat it but yours truly. That won’t be a problem as I’ve partnered with TheFeedFeed and Lindt Chocolate to bring you this elegant two-layer pavlova. As the Golden Globes are in just a few days a viewing party would be the perfect place to serve up a beauty such as this. (Lindt is the Official Confection Sponsor of the Golden Globes for the second year AND a Presenting Sponsor for the Weinstein-Netflix After Party!) The only foreseeable problem? It just might outshine all those celebrities in their fancy outfits. No, it definitely will ;) Because not only is it easy on the eyes with its rustic finesse, but I didn’t skimp on ingredients. Cara Cara oranges give the prettiest pop of color as a garnish and the mounds of cream filling each layer are made with Lindt White Chocolate. Mounds of thickly whipped heavy cream are folded into melted Lindt CLASSIC RECIPE White Chocolate to form a mousse-like cloud of fluff that contrasts so nicely with that crunchy, chewy meringue. I’ve always been a Lindt loving girl. As a matter a fact, I was in Europe several years back and while others with me likely had ancient buildings and historical artifacts on their list of “must see” items, I only had one thing I HAD to see. The Lindt factory. And it DID. NOT. DISAPPOINT. There were truffles there with flavor combinations that I had never even dreamt of. Like bitter dark chocolate paired with guava. Flavors you just can’t find in the US. I think my suitcase barely made weight when it came time to come home from that trip! I have yet to try a flavor of Lindt chocolate that isn’t just the bee’s knees. However, the simple flavors are my favorite. 70% dark is my go-to. And a milky white chocolate is just the thing to sweeten and flavor whipped cream for filling a dessert such as this pavlova. 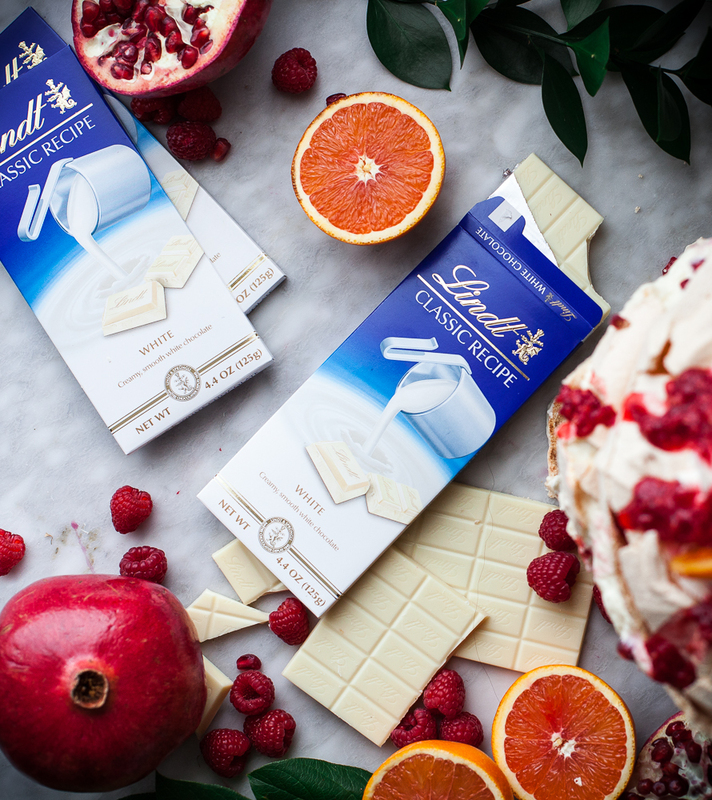 White chocolate pairs so nicely with fresh fruit and lets both flavors shine equally. Since white chocolate melted and alone whipped into cream will seize, I made a simple white chocolate ganache, cooled it, and then folded it into stiffly whipped cream. Give this dessert an hour or two to set up in the fridge before serving or it will be hard to slice without the cream bursting out of the center. I candied the oranges on top of my pavlova, but simple orange slices look just as nice! Be sure to check out the #LindtGoldenGlobesTwitter Party that Lindt is hosting on January 8th from 8-9PM EST! Preheat the oven to 325 degrees. Line a baking sheet with parchment paper. Trace two 7” circles on the paper, spaced apart from each other. Place the egg whites and salt in the bowl of a stand mixer. Beat the eggs, slowly moving up to high speed. In another bowl, whisk together the sugar and cornstarch. When the eggs form soft peaks, add the sugar mixture in one tablespoon at a time until the meringue becomes stiff and shiny. Sprinkle the vinegar and vanilla over the meringue and gently fold in until combined. Divide the mixture evenly between the two circles on the parchment paper. Spread the mixture out to a circle in line with the tracing. Smooth the tops. Place in the oven and immediately reduce the heat to 300 degrees. Bake the meringue for 1 hour 10 minutes on the middle rack. When baking time is complete, turn off the oven but do not open. Let cool in the oven for two hours. Remove oven and let finish cooling at room temperature. Place the white chocolate and ¼ cup of the heavy cream in a small saucepan. Heat on medium, whisking occasionally, until chocolate is melted and smoothly combined with the cream. Remove from heat and let cool to room temperature. Once the chocolate has cooled, place the remaining cream in a mixing bowl and beat to stiff peaks. Quickly and gently fold the white chocolate into the cream. Place in the refrigerator. Place the raspberries and honey in a bowl or mortar and pestle. Smash together with a blunt kitchen tool until jam-like in consistency. Place one layer of meringue on a serving plate. Spoon half of the white chocolate cream onto the meringue and spread to meet the sides. Sprinkle half of the raspberries and pomegranate arils over the cream. Drizzle half of the raspberry smash over the cream as well. Top the fruit dotted cream with the remaining layer of meringue. Spread the remaining white chocolate cream on top of the meringue (alternately – pipe the cream with a decorative tip over the top of the meringue). Decorate the top with orange slices and the remaining raspberries and pomegranate arils. Drizzle the remaining raspberry smash over the top of the pavlova. Refrigerate for at least 1-2 hours before serving. This post has been graciously sponsored by Lindt Chocolate - all opinions expressed are my own.